Is a reversal of the earth’s magnetic poles taking place? Volcanoes, earthquakes, strange noises from the sea. New shocking evidence points to a pole shift which, if it happens fast, will cause chaos around the world. 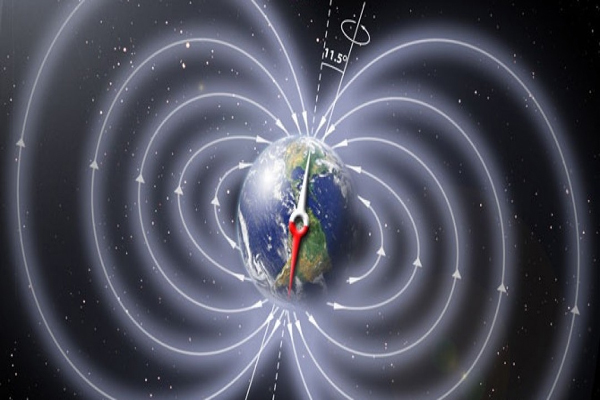 A pole reversal, when the earth’s north and south magnetic poles start to swap places, reversing the world’s magnetic polarity, has happened before. Scientists who track the history of the planet have identified 74 of these events by studying core samples. These are extracted from hundreds or thousands of feet down in the ground and in the thick polar ice. A sudden shift would throw the earth’s balance out so significantly it could trigger lethal earthquakes, tsunami on a scale we can hardly imagine capable of washing right across the United States and every other major landmass, volcanic eruptions so large and widespread that the resulting ash clouds and gases could blanket the sun’s rays and trigger a new sudden ice-age. Scientists look for evidence of previous Armageddon-style destruction by identifying “chaotic sediments” where narrow layers of earth, rock and ice record oddball events in the earth’s history in the form of bands of mud and tiny magnetically-charged fragments. To scientists, these are clear indicators of sudden floods, ice-melt or ash deposits. When this is found outside a long period of the cycle of freezing and melting in the earth’s history, it is an indicator of a pole shift. Pole shifts cause a major increase in the movement of the tectonic plates, the giant lines of opposing cracks in the earth’s crust which push and grind against each other until they periodically release like a balled fist in a closed palm flicking upwards. There are now signs amongst the sharp increase in natural disasters and other strange, apparently unrelated incidents which point towards a possible reversal. It is widely-recognised that magnetic north, that point at the top of the globe which compasses and devices which depend on magnetic navigation rely, is shifting increasingly quickly towards Russia from its current position above Greenland and nearer to Canada. It has moved 400 km in the last decade and is accelerating. Our sun swaps its north and south pole every 11-13 years and has just done so. The effect on the sun is to stimulate the number and intensity of solar storms which can have a major effect on the earth. They can interfere with tv transmissions and power supplies. Other signs which might indicate the effects of a magnetic reversal between magnetic north and south are an unprecedented seven volcanoes which have started to erupt around the world in the last few days, and a major spike of 7.0 magnitude plus earthquakes almost all of which I have witnessed personally a few days after the event as a documentary maker. The cycle started in Indonesia in 2004 and occurred again very recently in Nepal. These sharp increases in seismic activity do occur every 30 years or so and may be part of a natural ebb and flow but they are another aspect of what could be a major trend in the light of the relentless and quickening march of magnetic north east away from its original position. USGS and NASA are very concerned about a new magma chamber the University of Utah have discovered recently under Yellowstone National Park in addition to the enormous lake of molten rock and iron they already knew about. This one is an astonishing 11 times the volume of the Grand Canyon. A sudden pole shift could become the push the magma chamber with the surface area of Los Angeles needs to blow up. If it does, most of North America would be destroyed instantly and a new ice age would begin. Another story which begs the question “what on earth is going on” is a 300 metre (900 feet) high island which has appeared from the sea bed just north of the tip of Japan in just one night. This area was the origin of the 8.9 Magnitude earthquake which ripped through Japan in 2011, causing one of the worst tsunami of all time. Sections of crustal plates which suddenly move under enormous heat and pressure which cause earthquakes and tsunami have been known to move dramatically, although it is often never seen as it occurs miles down on the seabed. A new shelf 800 km (500 miles) and 60 metre (180 feet high) appeared off the west coast of Indonesia in 2004 which triggered the infamous tsunami wave which swept completely round the earth’s circumference three times. The new Japanese landmass appeared at almost exactly the same time as the Nepal 7.7 Magnitude earthquake took place 5,000 km (3,000 miles) away at the opposite end of the Eurasian tectonic plate. Finally the weirdest account of nature behaving strangely are reports of a strange humming noise coming from the sea. Scientists have explained this as the effect of the currents running though the oceans. Its Planet X. Thats what the chemtrails sprayed every day globally are hiding. The day of the next false flag to invade Iran, amerikka-the-stupid will be annihilated by Russia, China and the SCO. Planet X will end this war but by then 90% of the amerikkan sheeple will be dead. All planned centuries ago by thos slavedriving “gods” who made us to mine gold for them.